Brain Boy: Day 14: Did anyone get the number of that bus? I've been kidding about my forehead getting so big that it should give birth any day now. Well ... it's gone past "term" and the doctor told me to come in to induce labor. Translation: The fluid pressure has increased since surgery. Headaches and tenderness prevented me from sleeping through the night ... so Dr. Harry told me to come in. He did a biopsy and then drained about a bathtub full of fluid (okay, I exaggerated ... A half bathtub). 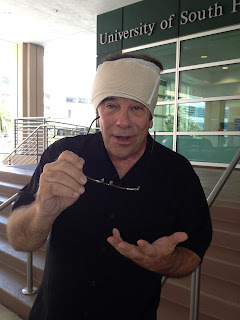 He then wrapped my head with two bandages which restricts the fluid as it comes back. I wear this for a few days. Seriously, still not feeling great. Hopefully I can get some relief ... But you have to admit, I finally have a great prop to show off. Tony Soprano will love it!